This week the theme for Playful Preschool is Community Helpers. Each week, our group of blogger educators shares a series of free preschool curriculum activities related to the weekly theme. If you have missed any of these posts or want to look back and try out the activities, follow the hashtag #playfulpreschool across social media. Also, on the bottom of each post, is a series of links to the other posts in the weekly theme making it convenient to form a lesson plan. 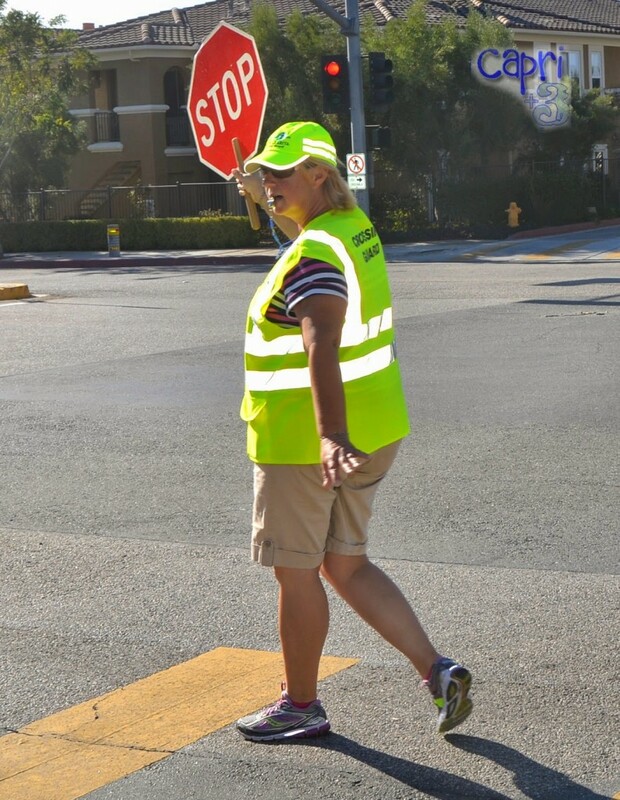 We decided to go and meet a local crossing guard and find out more about what she does. Miss Anita helped us practice safely crossing the street by learning to wait for the sound of her whistle before crossing. She told the Sugar Snaps that they would be able to hear the whistle better than her voice. We stopped what we were doing, looked out for cars and listened for her whistle. She showed us how she holds her stop sign with one hand and holds her other hand out in a stop gesture to remind cars to stop. She had the Sugar Snaps practice the stance. Miss Anita showed us her bright colored vest and quizzed the Sugar Snaps about why it was that color. They figured out that the bright color made her easier for drivers to spot. She informed us that crossing guards work at the same schools each day so that they can get to know the children and parents in the community which enhances safety for everyone. Greg made us a printable stop sign which we will share with you so you can make a stop sign with your children or students. 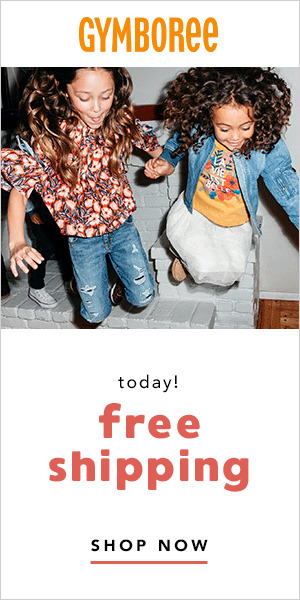 Click the link below to download yours. Discuss the octagon shape of the stop sign. Have the children count the sides and then cut out the stop sign. This is great for developing scissor skills! Our four preschoolers were all at different levels. Some signs required tape for repair. Next, have your preschoolers tape the craft stick handle onto the inside of one of the stop signs. Then, they can add glue and put the two signs together like a puzzle. Ours found fitting them together with the glue inside to be a little bit tricky and some needed assistance with that step. Hold hands with a grown-up. Stop away from the edge of the curb. Look both ways for cars more than once. If there is a crossing guard, follow instructions and wait for the sound of the whistle. Go out in the neighborhood with the homemade stop signs to practice. 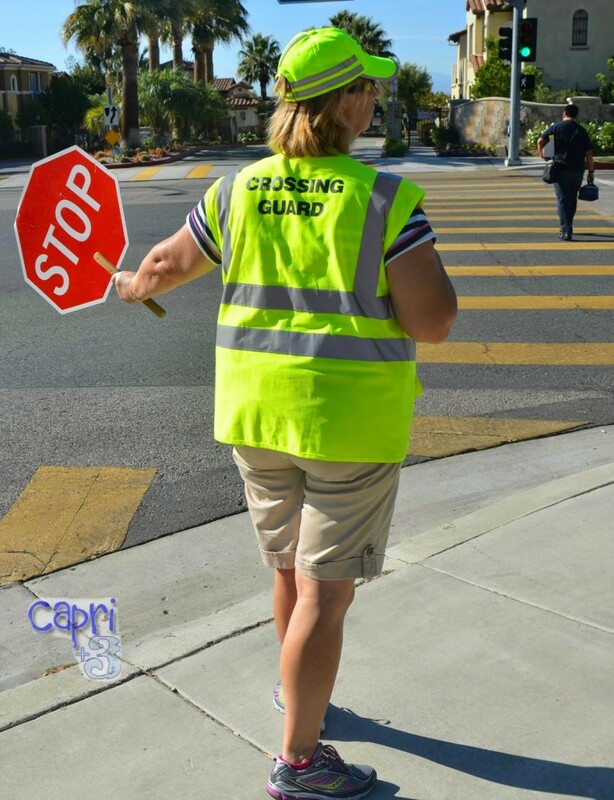 Discuss how crossing guards are specially trained community helpers and that kids can pretend to be crossing guards but cannot be one until they are adults. Look for the pedestrian signs. Discuss how these signs are in the shape of a pentagon. Have your preschoolers count the sides and remember that it looks similar to the shape of a house. 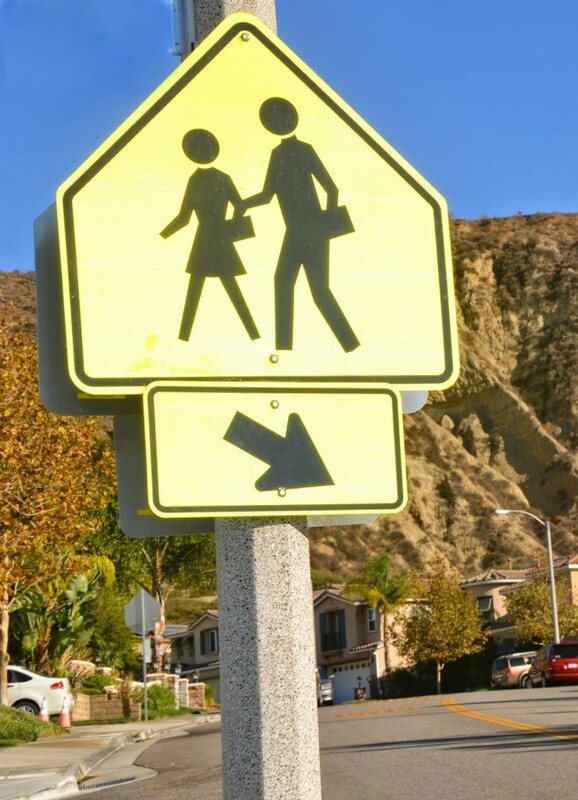 Have your preschoolers pretend to be crossing guards without actually going into the crosswalk. Neighbors in the community found our pretend play with homemade stop signs to be amusing. 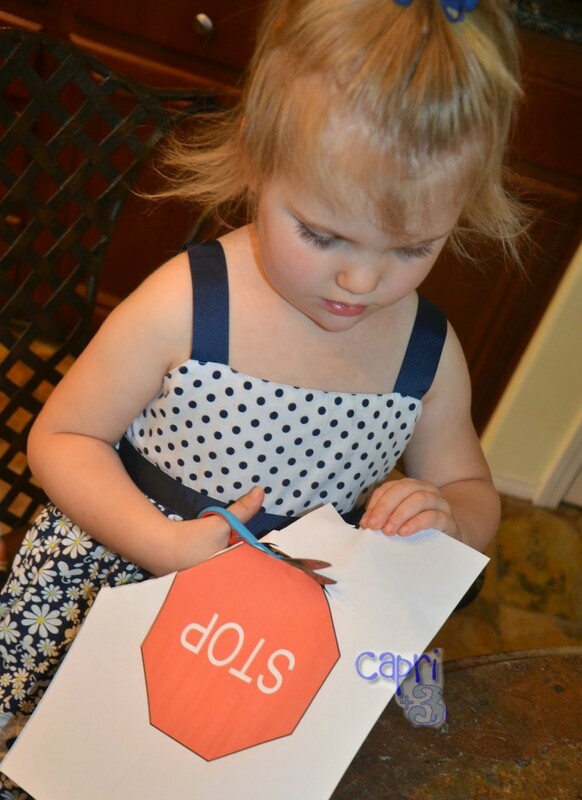 The Sugar Snaps continue to enjoy pretend play with their stop signs. I put the first initial of their names on each stick so that we could tell them apart. Have you taught your children or students about community helpers? What activities have you tried? Such a cute craft for preschoolers to do. They had a lot of fun making and using their stop signs. How fun! I love that you went and met a crossing guard and learned from her. Such a great field trip for a preschooler! We had a lot of fun meeting Miss Anita. I didn't realize she used a whistle to signal it was safe to cross until she showed us the protocol. That helped me to be able to add that into their pretend play. Thank you this will be a fun activity and to be teaching them safety at the same time!! Perfect!! Thank you. I hope you enjoy the activity. I couldn't wait to "grow up" and be a crossing guard in 5th grade! Wonderful idea to plant the seed in preschoolers. It is so fun to look back on all the things we wanted to be when we were little. I had several different professions I wanted to 'be' at different times. Thank you. They had a lot of fun. Such lovely ideas, you should consider making an e book. I would love to make an e-book in the future. Thank you for your kind words. Love how the kiddos met a crossing guard and really practiced the job!! What a neat activity to let them meet a real crossing guard first. I'm sure that made the "make believe' part much more fun!! They had fun meeting a "real live" crossing guard. 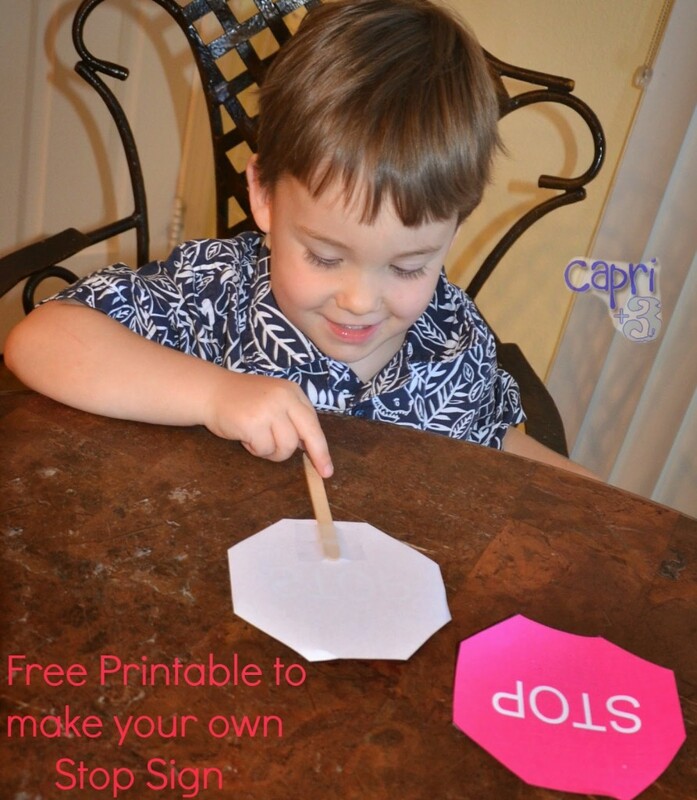 This is such a great pretend play learning activity for kids! Thank you. Yes, I think they understood what the job was about much better after the 'interview' and practice with the crossing guard. She was so nice and helpful. We were lucky she enjoyed our surprise visit. They had a great time learning from the real crossing guard and then pretending to do her job. Thank you. Miss Anita was happy to help us. I'm sure she'd help you too. : 0 ). I imagine you could do as we did and find a local crossing guard to interview and practice with. We were lucky Miss Anita was so open to having us there. I imagine most crossing guards do enjoy children. This is cute. My daughter is obsessed with following rules, so this would be a great project for her. Such a cute and important lesson. 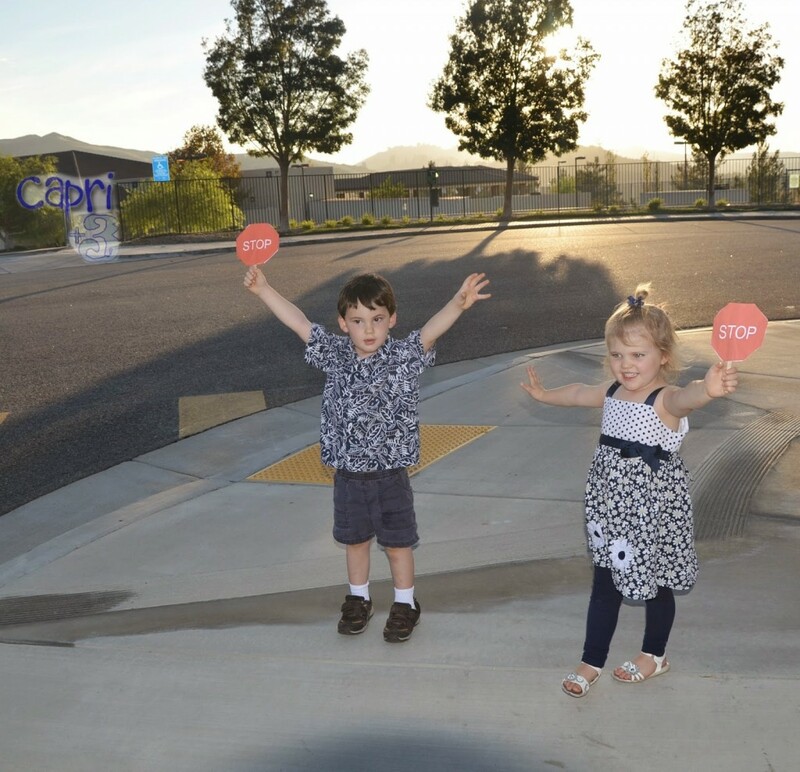 My kids love to play with their stop and go sign. That is cute that your daughter loves to follow rules. I agree that this would be great for her. Stop signs are a lot of fun and are easy for children to recognize. Thanks for your comment. I love that you connected with the crossing guard! What an important job they have. :) The stop signs are great practice. 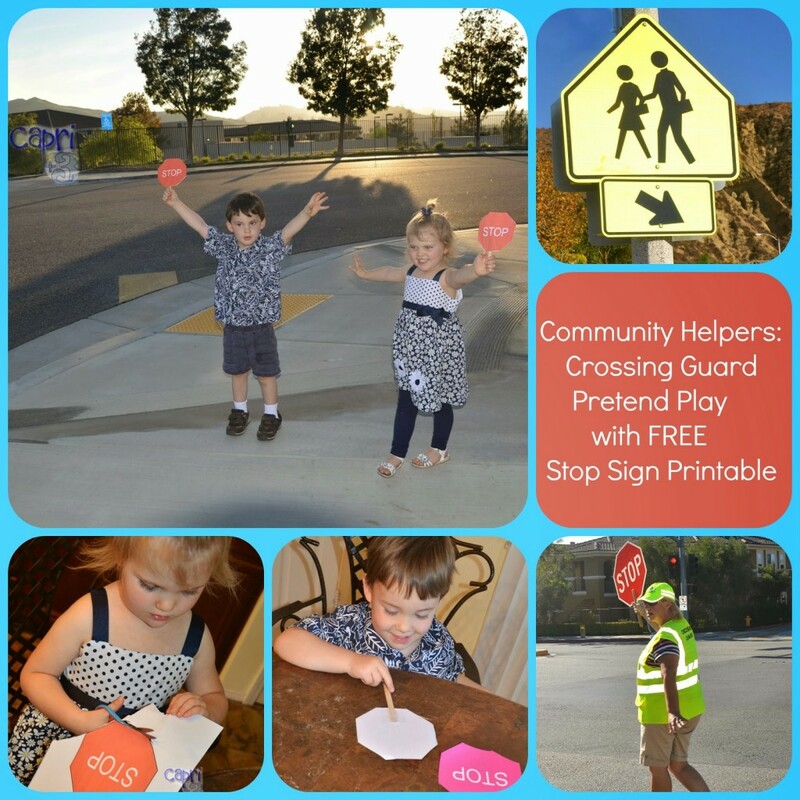 You may have future crossing guard helpers growing at your house! I imagine they would love to be crossing guard helpers some day. That would be fun. What fun! We don't work with a crossing guard, since our littles are at home for school, but this is a sweet idea! We actually don't either as ours are preschool age. They had never heard of a crossing guard before this lesson, but they had a lot of fun learning about the profession and pretending to do the job.